The Sega DreamCast CD's are actually GD-ROMs, sort for Gigabyte Disc, holding maximum 1 Gb of Data instead of the standard 650-700 Mb. Developed by Yamaha, the GD-ROM is a proprietary format which works by packing the pits on the disc closer together to store more data. Along with more storage the GD-ROMs provide an extra level of Copy Protection as they cannot be reproduced using a standard CD-Writer. The are 3 distinct area's when you look at the bottom of a GD-ROM disc. The low-density inner track (dark gray) contains about 35 Mb (4 mins) DATA which is also accessible by normal CD-Readers. The outer track (light gray) contains about 1 Gb (112 mins) DATA but is written in a high density format which can NOT be accessed by normal CD-Readers. 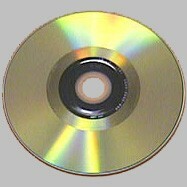 A normal CD-Reader will only read the first, inner track and won't read past the black area. Even if it could read past the black area then it can't read the high density track. There is for now NO WAY to make a backup of a GD-ROM onto a CD-R using a normal CD-ReWriter. A CD-R media will NEVER hold more than 99 minutes of Data (= 870 MB) so it can never hold the 1 Gb a GD-ROM. GD-R writable media does exist but they are only sold to official DreamCast developers. They are NOT sold to the general public. People claiming that they made a working copy of the first few DC games, using packet writing software, were just lucky. They only copied the first normal density track which can easily be copied, but the second high density can't be copied. 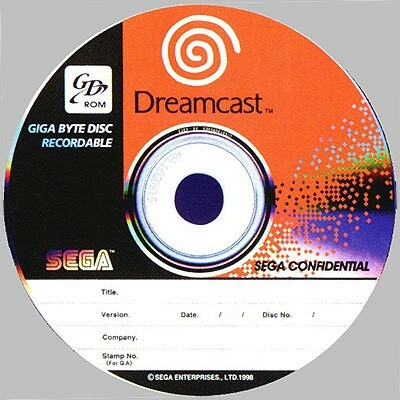 Using a DVD-R or DVD+RW is also not an option as the DreamCast can't read DVD-R or DVD+RW media! 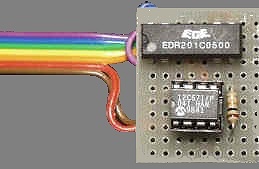 The only thing that is available are the DreamCast MOD-Chips (see graphic). These chips are build into the DreamCast and modify the machine so it accepts copied DC games. These copies are pressed/silver CD's and they are mainly made in the South-East Asia region (China, Taiwan...). The DreamCast MOD-Chips are similar to the existing PlayStation MOD-Chips but these need less wires to connect. For a very complete installation overview/instructions checkout this DreamCast MOD-Chip site.